Hey everyone...I'm a 36 yr old mother of 3 and I love to write...I found my writers voice with a Kevin Fanfic I wrote...unfortunatley due to technical difficulties the sequel to my first one has been lost forever. but I hope you enjoy my writing. 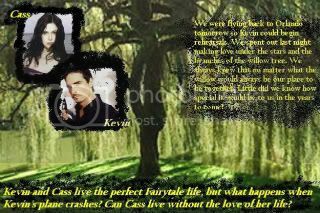 Kevin and Cass live the perfect Fairytale life, but what happens when Kevin's plane crashes? Can Cass live without the love of her life? Follow the love story of Kevin and Cass and their friends!